When I worked for Seventies I was very honoured to be able to meet some of the people in BMX that I had really looked up to and grew up watching as a teenager. Seth Kimbrough was one of those guys, even though he’s about the same age as me we’d get the videos and DVD’s arriving over here in the UK and all of us would be watching the lates moves from across the pond. Seth has always been an interesting and inspiring rider to watch with a style that for me is mixed between the midschool of the late 90s early 2000’s with burley tricks, gaps, grinds and the new school of technical lines. He has a banging section in The Shadow Conspiracy’s Into the Void video and you can see it after the photo. The shot was taken on one of Seth’s UK visits to meet up with his friends and fellow team mates Bas Keep and Mad Jon (at the time Bas rode for Hoffman before Cult) and we headed North to the stomping grounds of the spot master Owain Clegg. 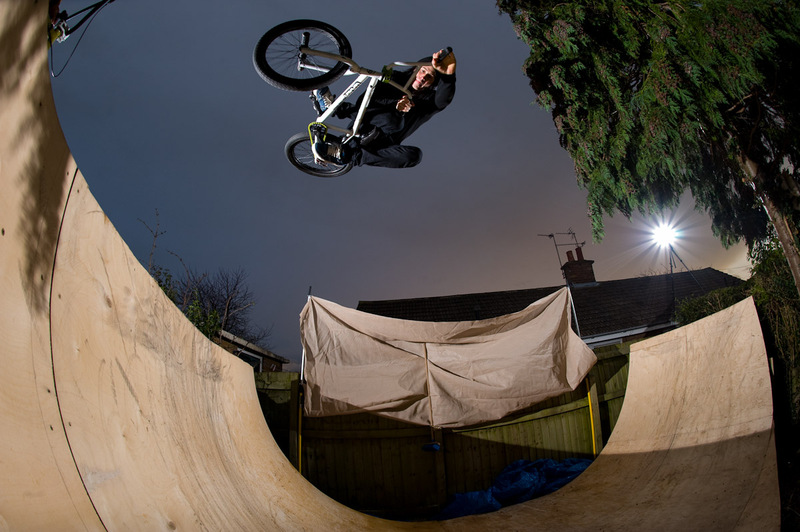 After a day out riding street and the local plaza we headed back to Owain’s house to check out his extremely tight ramp setup he had in the back garden. Seth like a bloody pro he is was getting all over it and busted a few clicked tables for the camera.